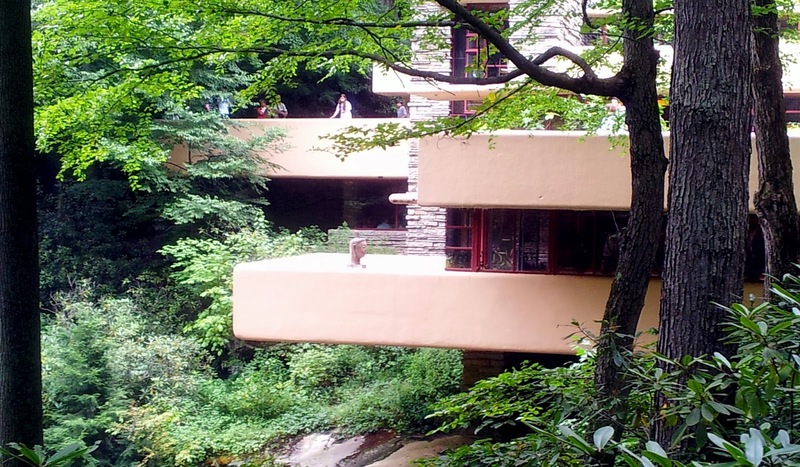 The structural design for Fallingwater was undertaken by Wright in association with staff engineers Mendel Glickman and William Wesley Peters, who had been responsible for the columns featured in Wright’s revolutionary design for the Johnson Wax Headquarters. 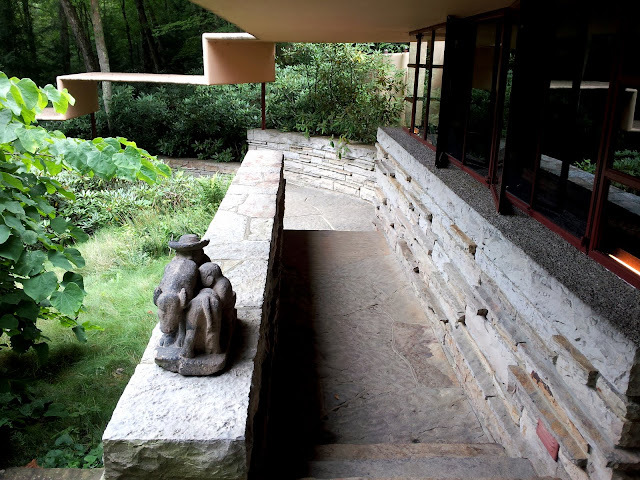 For the cantilevered floors, Wright and his team used upside down T-shaped beams integrated into a monolithic concrete slab which both formed the ceiling of the space below and provided resistance against compression. 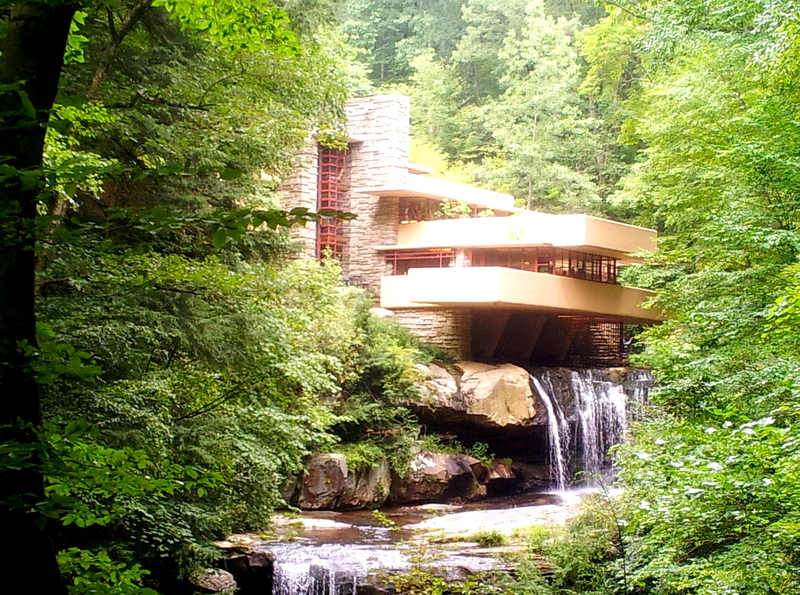 Bear Run and the sound of its water permeate the house, especially during the spring when the snow is melting, and locally quarried stone walls and cantilevered terraces resembling the nearby rock formations are meant to be in harmony. The design incorporates broad expanses of windows and balconies which reach out into their surroundings. The staircase leading down from the living room to the stream (mentioned above) is accessed via movable horizontal glass panes. In conformance with Wright's views, the main entry door is away from the falls. On the hillside above the main house stands a three-bay carport, servants' quarters, and a guest house. These attached outbuildings were built two years later using the same quality of materials and attention to detail as the main house. The guest quarters feature a spring-fed swimming pool which overflows to the river below. I have a few critical comments to make about this celebrated structure of American design. While certainly "bold" and original, it fails remarkably in many ways. I usually prefer to overlook imperfections, but in this case it is not possible. The color scheme is hideous, I mean absolutely grotesque. I had always thought of it has having a white stucco, not skin colored, "peach" or "light tan". This color does not compliment the flora or the landscape in any way. In fact, it is entirely objectionable. The Japanese love white stucco and white buildings, therefore I do not understand why he would have opted for this choice though I have read that it was Wright's original intent to gild the concrete in dull gold leaf. 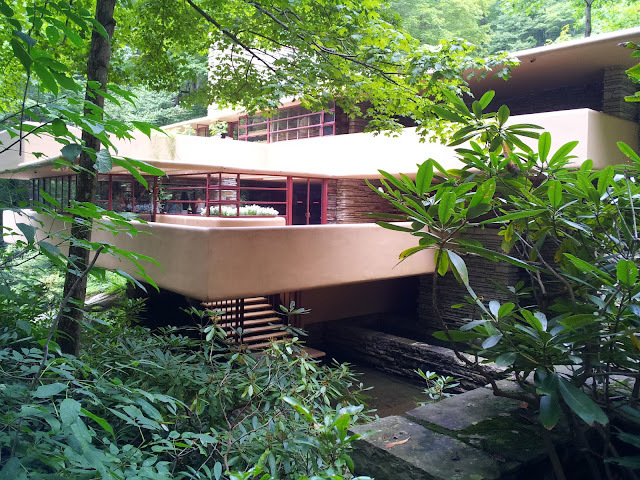 ( Toker, Falling Water Rising): The interior has a veneered black walnut finish that is not complimentary at all to the burnt orange window frames. Additionally, the windows were brush painted (in the renovation perhaps) and the strokes are visible. How terribly wrong to brush paint steel now. If Wright truly studied Japan, he may have better understood how to integrate organic materials and neutral colors together, particularly with wood. I suspect that the Western Pennsylvania Conservancy's bureaucratic management scheme is a contemporary problem. How could they accept the visible membrane flashing on the terraces? (a result of the 2002 renovation). With a renovation of this significance, it is unfortunate that the preservationists did not collude well with the aestheticians. The grounds are entirely overgrown. Living in harmony with nature does not necessarily mean allowing the trees to take over the site. The tour was like being force fed by an overbearing nurse. I do not understand why they have to run the tours so aggressively. At any one point in time, there are at least three groups of 10 people in the house. The standard tour was $20, but I felt like I was in a cattle chute being herded around. I understand that the demand is high for this "masterpiece" of the "greatest American architect of the 20th century", but let's be honest and say that it is not quality that draws people here, but novelty. 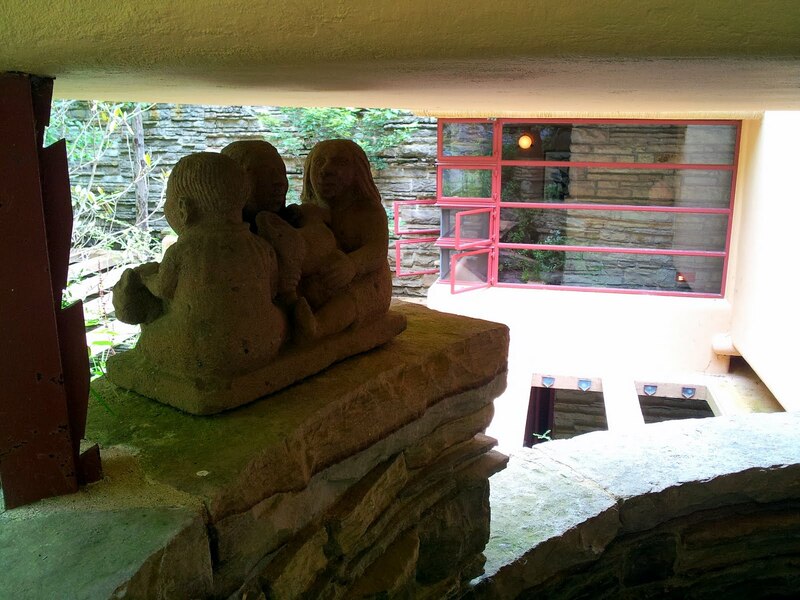 That being said, Fallingwater is an interesting place, a veritable oasis in an architectural desert, and worth the trip.